Over hundreds of years, how many sandal-clad feet have entered these walls? What stories these weather-worn stones could tell. Especially, in Baja, and even moreso in the smaller areas, it’s hard to come across a “real museum” like the kind the average tourist might be looking for. There just aren’t that many. But, I have found in my travels that if you really want a glimpse into the history, culture and soul of any place or people, there’s usually a museum in even the smallest towns or pueblos. They’re just not labeled as such. Remember when we were kids and many of us had to build a “California Mission” in 4th grade? It threw our families and fathers into a frenzy! Our older sisters had to do it. Our younger brothers had to do it. The school chum next door had to do it. There was no escape from the cardboard, sugar cubes, construction paper and macaroni rooftops! But, for many of us, our delving into the missions pretty much stopped when the mission got dumped into the trash. 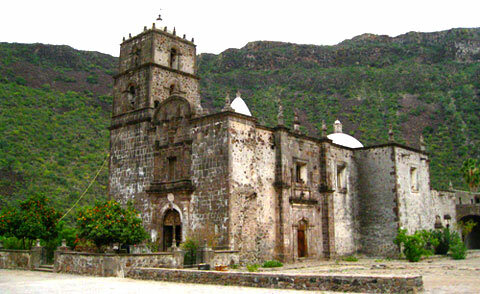 But, the California missions were just a long line that extended all the way down to the tip by Cabo San Lucas. Those missionaries from Spain accompanied by their conquistadores were a busy lot. Claiming land and native souls for the Spanish crown…and the Church. In that endeavor, they blazed a crazy trail up and down the western coast setting up churches big and small. Many of us have visited the Califorinia missions regularly and they are huge tourism destinations…San Juan Capistrano…Santa Barbara…San Luis Rey. Pretty much many California cities can trace their genesis to an adobe house of worship around which grew a plaza…then a pueblo…then a village…San Diego…Los Angeles…Monterey to name a few. The same thing happened in Baja but with less notoriety. But, the Fransiscan, Jesuit and other Catholic padres toiled in perhaps greater hardship in more arduous situations to eck out there footholds in Loreto, La Paz, San Jose del Cabo and numerous other little dots in the Baja desert. Some are still there. Others have disappeared into the deserts. The history of each location is written in the church. As the center of culture, religion, and the life of the pueblo, history is recorded. In my travels, I have found this to be unfailingly true….Buddhist temples…Jewish Synagogues…Christian cathedrals…Greek Orthodox churches…even the littlest chapel in the middle of nowhere, there is history to be found. Where we live in La Paz, one discovers that the city church took numerous tries to be established. The Spanish kept getting rousted by the local natives who didn’t take well to being overlorded by a new king or religion. Check out the church in San Jose del Cabo and find out about the padres who were martyred in their efforts. They died horrendous deaths attempting conversions. Take a day trip up the winding goat-trail-road to the mountains above Loreto to San Javier. The candle soot on the walls has been there for eons. Who in the world carried these giant beams up this mountain to build this church? How many native “converts” were convinced to haul this massive Spanish altar here using only ropes, burros and sunburned backs? In any church, look at the woodwork; the pews; the statues; the art. It had to come from someplace or someone’s backbreaking work. Even moreso, take a reverent walk through the cemetery. Check out the last names. Spanish? Indian? Anglo? Italians? Asian? A surprising number of Asian and Italians were part of the Baja frontier. So were the Portugese who joined along as pirates, adventurers, convicts and merchants either voluntarily or involuntarily hoping for a better life in the New World. Remember also, that the Spanish came with slaves. Check the dates. Life was short and brutal. If you made it to 30 years, you were pretty much dubbed an elder! Many babies and children are buried as well. Disease and a hard life took many early. Women and girls married early. Many died in childbirth. Men married again. Had more kids. More kids died. If you see an abundance of deaths close to each other consider an epidemic of smallpox? Measles? An attack by natives? All of that is there to ponder and discover. Inside many of the churches themselves, are the tombs or relics from the old padres themselves or, in some cases artifacts from the actual saints for which the church is named. Someone, from thousands of miles away in Europe carefully brought it over. Imagine that journey. Months on a leaky pestilent wooden ship. Overland on foot or animal in the heat in sandals or boots. Mountains. Deserts. Rocks. Insects. Hostile locals. No water. That’s how they rolled. All for a piece of bone. A bit of vestment from the old country or the old monastery that belonged to the venerated saint. Yes, those are right there under the brick and cement by the altar. If you can still make out the chiseled lettering…You’re standing on the 300-year-old tomb of the old padre who made that insane journey on a wooden ship from Spain and never made it home again. If you’re looking for history, look no further than the local house of worship. Just remember that these are still churches and should be treated as such. The ghosts of the past are always willing to speak to you, but don’t forget that the living are still holding Mass…getting married…getting baptized. Church remains the center of life for many as it did centuries ago. Doff your hat. Keep your voice down. Take it easy with the photography. Drop a few dollars in the poor box. Listen carefully and history will tell you it’s own story.